I am so honored to introduce you to Joe Andruzzi Foundation Marathon Team member George Marr, who is continuing to raise money for our cause, despite a hip injury that required surgery and put him on the sidelines – for this year’s race, anyway. Below, you’ll read a very honest and inspiring story about why George – a 37-year-old contractor from Narragansett, Rhode Island – runs. We’re honored to share in his incredibly touching journey and proud that he’s dedicating his immense heart and willpower to helping us fight cancer. Thank you, George. We’ll look forward to seeing you run Boston next year! George: I’m going to start by saying that I am a qualified, registered runner, which means I did not need the charity waiver to run in Boston. That being said, very early in this process of committing to running the Boston Marathon on behalf of the Joe Andruzzi Foundation, I suffered a hip fracture and had to have surgery. That surgery required I withdraw from running the marathon. However, as you read on, you’ll see why I decided to stay on and raise funds, anyway, even if not on the level I had originally planned. George: On January 24, 2011, my father lost his battle to cancer and eight months later, I lost my mother to the same disease. During the years leading up to 2011, it became obvious it was going to be difficult to try and maintain financial stability, having to assist in all of the treatments and surgeries and chemo they were forced to endure. I have a large family and we all contributed. However, I now feel like sometimes I had to make a choice to help them or help myself. I can’t even imagine how it would feel to be a parent in that situation. To have to make the choice to be at the hospital and watch your world fall apart. What the Joe Andruzzi Foundation does is help people when they need it the most. I can’t imagine a better cause. George: I have run four marathons. Three of which were in my quest to qualify for Boston. 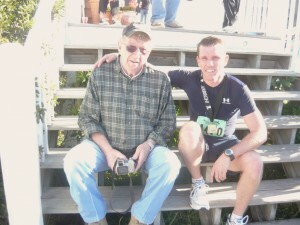 In 2008, I ran my first marathon in the Outer Banks of North Carolina. I tanked so bad; I was so poorly conditioned that I literally had to crawl around for four days afterwards because I was hurt so badly. I swore I would never run again and I didn’t for about four months. After the pain was forgotten, I thought for the first time about trying to qualify for the Boston Marathon. My second attempt was in Providence, Rhode Island, in May of 2010. I was better trained this time, but fell short of the fabled “BQ” (Boston Qualifier) by nine minutes. Which, believe me, is a lifetime at the end of a marathon. But I ran the entire race, proving to myself I could do it. Then I got serious and got my first training plan. I ran my third marathon In Richmond, Virginia, in October of 2010. With the help of friends and a training plan, as opposed to just running, I smashed the qualifying time by 19 minutes and guaranteed myself a spot in the most sought-after amateur race in the world. By that time, though, the 2011 Boston Marathon registration was closed. During these attempts, the biggest supporter I had was my father. I called him at the finish after every race; I think it really kept his mind off his illness. He never stopped believing I could run Boston, even when I didn’t. He died in January, before I was able to call him from the finish line in Boston. In February, 2011, I got the opportunity to run on another charity team. I ran and dedicated that race to my father. It was a very difficult race. Every time the wind blew at my back, pushing me forward, I knew it was him telling me not to quit. George: The race itself is the reward. The hard part is the training and the dedication it takes to get there. As far as running the race itself, control is the key. Always run slower than you think you should, until you’re sure you can make it to the end. Then, you can sprint, dance or skip across the finish line. George: Why I run is the hard part of this interview. I am a recovering addict – an alcoholic and a previous cigarette smoker. Five years and forty days ago, I was sitting in a jail cell because my lifestyle choices had led me there. It was there in that jail cell that I decided to start running. You see, I always wanted to be a runner. When I was in grade school, I was always one of the fastest runners in gym class and on the playground. But by the time I got to junior and senior high, I began making the wrong choices. My father was an alcoholic until I was 16 and my home life up until that point was less than ideal. Drinking and drugs provided an escape, of sorts. My father quit drinking when I was 16, but by then I was smoking and drinking and already experimenting with drugs. Throughout high school, I always wanted to run on the track team, but without any support from home it never materialized. My first run was only 1.5 miles, but it wasn’t long before I went farther and faster. Running for me at that time was a welcome step in my recovery. An escape from all of those temptations and rogue feelings I’d hidden from for all those years. I was no longer an addict loser, I was a runner. During those six months in rehab, I set my sights on my first 10-mile road race; it was the Blessing of the Fleet 10- miler in my hometown of Narragansett, Rhode Island. I’d known about this annual race, which oddly enough coincided with my graduation weekend from rehab. And running it felt like it would solidify my new life as a runner and release me from my old life. It was 6 p.m. and 85 degrees with 90 percent humidity when the gun went off. I never suffered so much in my life. At mile 6, I knew I was never going to make it, but somehow I did. I finished. I didn’t quit. I achieved a goal. I was now a success, for what felt like the first time. I made my father proud and he told me so for the first time at age 32. The day after, I was in so much pain I swore I would never run again and didn’t for about six months. George: I have a broken hip; I have been on crutches for seven weeks and it will be 11 more before I can run again. George: I remember where I came from. George: My current marathon goal is to break the three-hour mark. George: I planned a fundraiser on February 20th at a local restaurant.